('dog 'smärt)… to be knowledgeable, intelligent or mentally alert about dogs; their health, behavior, needs, social norms, development and all the things that make up the dog psyche. We are Melba and Curtiss Lanham – owners of dogsmart. 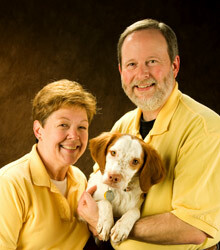 We are trainers and behavior specialists for your canine companions. Choosing the right folks to help you solve behavior issues OR just starting off in the right direction with your new puppy or dog can be challenging. Our goal is to take the anxiety out of that decision. Aside from an intensive 6 week dog trainer training program and national professional dog trainer certification, we draw from our life experiences: professional dog trainers and behavior specialists, hobby dog trainers, EMS instructors, paramedics, corporate trainer, 10 years in Veterinary medicine and dog rescue organizations. We attend conferences, workshops and read current periodicals and texts to stay abreast of the latest in training and behavior. We are members of the Association of Pet Dog Trainers (APDT). We use only force-free training methods…period. We hope you will invite us over for a consultation to get to know us better. We feel certain that we will serve you well with our fun, family-friendly programs…and help you all to be dogsmart!